Coverage: Listen to BBC Radio Scotland, follow live text commentary on the BBC Sport Scotland website, and watch highlights on Sportscene. There can be "no excuses" for Rangers if they are knocked out of the Scottish Cup by Kilmarnock, says former Ibrox midfielder Alex Rae. 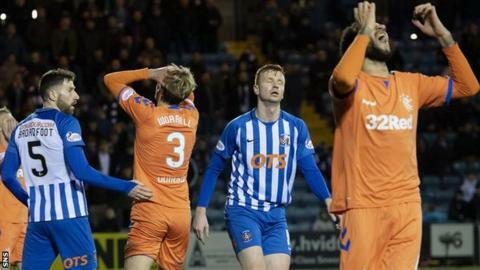 Steven Gerrard's side host the Ayrshire men in a replay after the two sides drew 0-0 at Rugby Park. Rae agrees with Gerrard that the Scottish Cup could define their season, and says Rangers "have to deliver". "This is probably the last chance for silverware at Ibrox this season," Rae told BBC Scotland. "There's pressure all the time at Rangers. You're expected to win trophies and that comes from the manager as well. You've got to embrace that, that's part of the pressure of playing for Rangers." Manager Gerrard criticised his players after their goalless draw at home to St Johnstone on Saturday, labelling his side leaderless and urging for a "huge improvement" in the cup. Rae, who spent two seasons at Ibrox, believes that Kilmarnock boss Steve Clarke is right to travel up the M77 with confidence having not lost to Rangers in their last three meetings. He said: "I like what Steve Clarke is saying. He's putting it on his players, saying he wants to be in the next round of the cup. "They feel as if they've got enough to cause Rangers some problems. "It's finely balanced. It's really geared up for a good night of football."